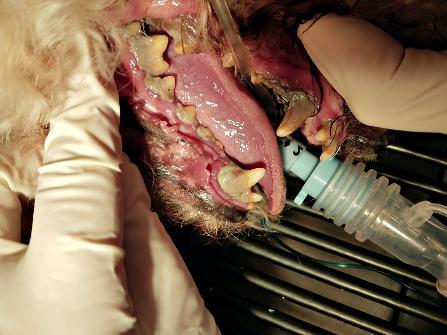 Full anesthesia is used when cleaning your pet's teeth. This allows us to do a thorough scaling of all areas, including under the gums. An ultrasonic dental scaler quickly and safely removes built up tartar. We follow with polishing and a fluoride treatment. Our dental table allows water to flow away from your pet, as well as providing optimal access to your pet's mouth. Look at the difference a cleaning made for this dog! Her breath smells better and his overall health is much improved! We have the new Vetpro 1000 Mobile Dental Delivery System! This dentist machinery is high powered and improves efficiency during the procedure. If your pet needs a tooth extraction this new dental machine makes the extraction go by much smoother with its high powered drill. It prevents tooth breakage while extracting and helps prevent pain when the animal goes home.